...........Approx 10 minute sketch from tonights class. Laura P model came as "Rosie" from Bye Bye Birdie..even brought her own music! While not perfect, I liked this drawing enough to post...always been "drawn" to reclining poses. 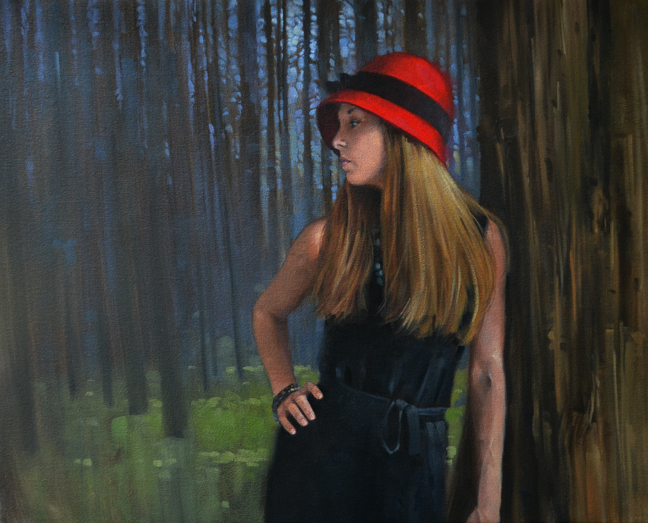 ............24x30 oil on canvas of girl in woods. Model, Erin. Another in a running series of models in the middle of forests. It's just a combination I like. To me, being in the woods, alone, is very peaceful but slightly scary at the same time. In this piece, the model takes center stage and the "stage", or the woods, is secondary. ...................This painting came from a recent trip to St. Marys and Cumberland Island Georgia. I realized after I got home and was looking at my photos that the name of this boat was "The Red Witch". 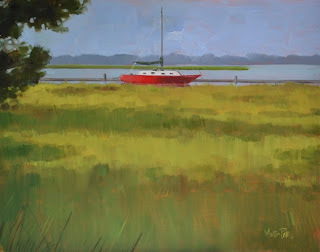 The color caught my eye and the composition of the marsh grass and shadows seemed paint worthy. "Red Witch in St.